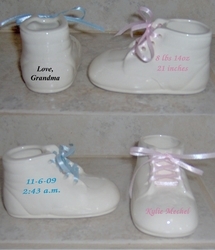 These 4” x 2.5” handcrafted ceramic baby shoes are personalized keepsakes that will last for a lifetime! Choice of Black, Blue, or Pink font. Choice of Pink Or Blue Ribbon. Personalize it with name, birth date, time, birth weight, birth length and a small message on back! Aren't these just deliciously delightful? and a short message on the back. Please order carefully. Personalized shoes are custom made and cannot be refunded. However, they will be corrected or remade, at no charge, if a mistake was made on our part. Please email photo of shoe when informing us of a mistake or damage.